Do you have a favorite flower that you can’t help but stop to smell whenever you see them? Lilies are one of mine, and I get so giddy and happy whenever I see them. They are just so pretty! 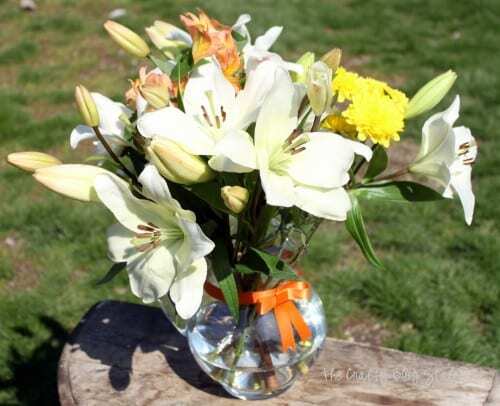 Today, I’m going to show you how to easily arrange a beautiful bouquet of Lilies in a fun glass pitcher I found at my local thrift store. Lilies are perfect for every occasion. They are beautiful and modern, perfect for an anniversary or birthday, … or even when you need to apologize or forgetting one of those occasions. To start, I went on the hunt for Lilies. 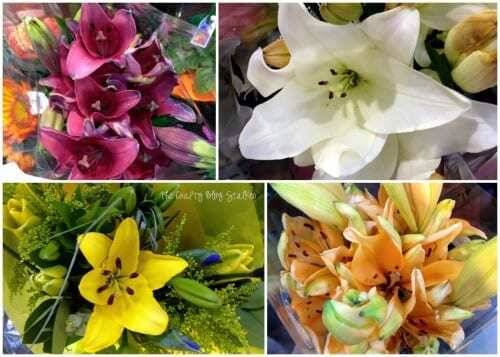 There are so many places that sell high-quality lilies like grocery stores, garden centers, and flower shops. I purchased mine at the local Walmart. There were so many gorgeous Lilies in beautiful colors that it was hard to decide! I really like the pink ones but decided to go with the white lilies that have a hint of pink in them. I also picked up a small bouquet of mixed flowers to add to the arrangement that matched the colors of the lilies. First, make sure the glass pitcher is nice and sparkly clean. 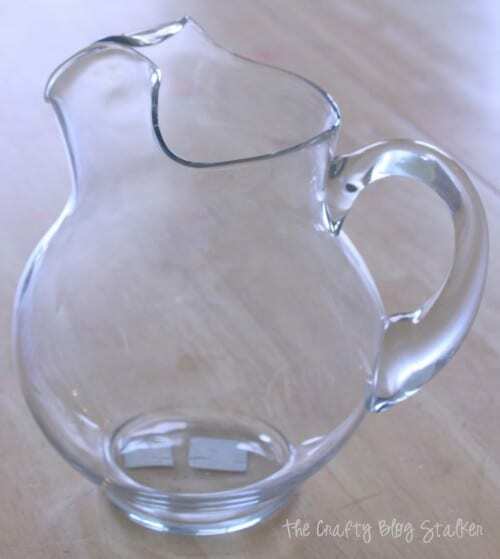 I looked at the pitcher for quite awhile trying to decide if and how I wanted to decorate it or not. The flowers should be the focal point, not the pitcher. Ultimately, I decided on adding a piece of ribbon around it with a simple bow. 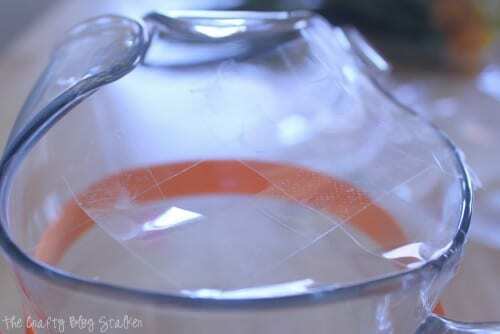 On another strip of ribbon, put a glue dot on one end and attach to the other end so it forms a circle. 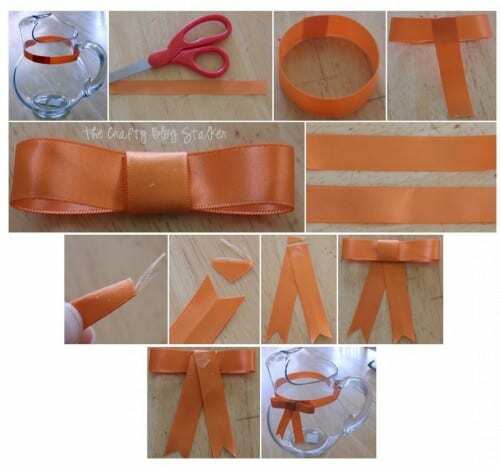 Cut a shorter piece of ribbon and wrap around the center of the flattened circle forming the bow. With 2 more pieces of ribbon and pinch the ends in half and cut at a diagonal so you can get the nice banner ends for the tails of the bow. Adhere tails to the back of the bow using a glue dot. 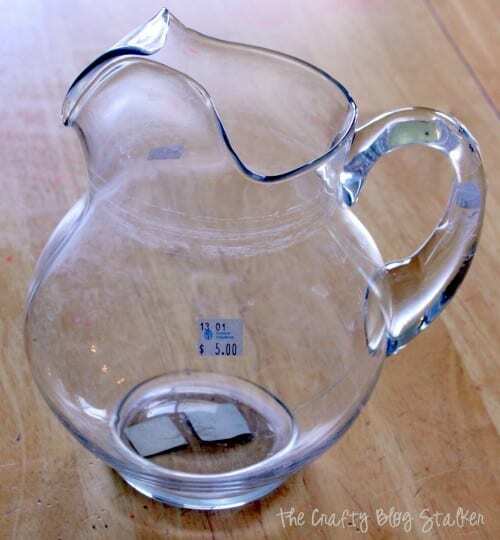 And adhere bow to ribbon strip on the pitcher with a glue dot. On the top of the pitcher, I cris-crossed some strips of scotch tape so all of the flowers wouldn’t fall to one side. I tried to take a picture, but it is kind of hard to see. Now to arrange the flowers! Don’t let this part stress you out, it is actually much easier than it looks.Keep the center stems longer and the ones around the side a little bit shorter to help fill in the holes. Insert one stem at a time through the tape grid. Use longer stems in the center for a higher focal point and use shorter stem flowers around the outside to fill in the bouquet and hide the stems of the taller flowers. If you don’t like a flower placement, simply remove it and put another its place. If lilies aren’t your favorite, that’s ok. This technique works for any flower arrangement! What flowers would you use? Share and leave a comment below! 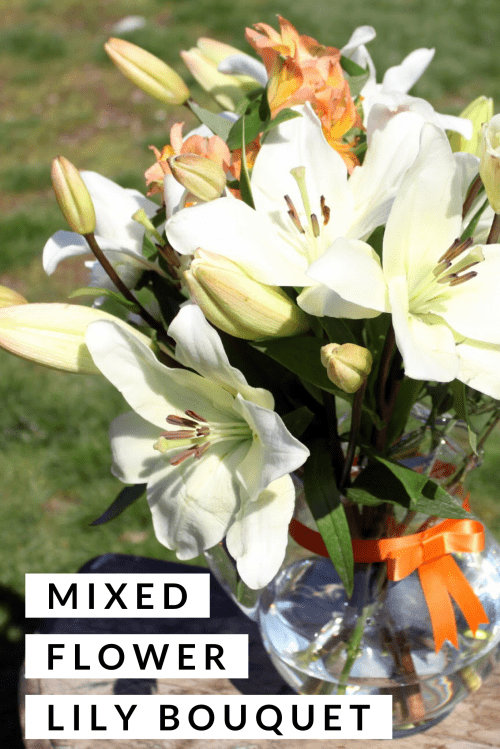 SAVE HOW TO MAKE A MIXED FLOWER LILY BOUQUET TO YOUR FAVORITE DIY PINTEREST BOARD! Ahhhh I love lilies and so does my mom so I’d make a vase of them to give to her. I would do something with scrapbooking, so neat, thanks! Maybe a wreath, My mom loves wreath’s and lilies too! I’d like to make a spring door wreath. I would make a wreath. I have a square glass container I have been wanting to fill up with one springy type of flower or another, so I’d probably give that a try! I just moved and would like to freshen up my decor, so I would make a new wreath for my front door. 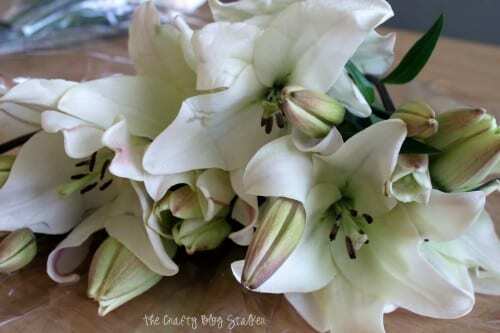 I would make a centerpiece for my dining room table and put candles in the center of the lilies! I would do a pot with a chicken wire cloche over it. I would love to make a wreath for my front door! I would use them for a table centerpiece~beautiful! I would make a center piece for our dinning room table. I would make a spring floral arrangement for my living room! Thanks for the chance. Lilies are so pretty and just say, “Spring is here.” Thanks so much for linking up to Inspire Me Wednesday! Hi Katie! This is such a beautiful bouquet and so lovely for spring or Easter. Thank you so much for sharing at Best of the Weekend and pinning! Hope you’re having a wonderful week! Very pretty lilies! Thanks for sharing at the Anything Goes linky at Bacon Time. Hope to see you again tomorrow.